Work work work - how can I get away with wearing sweatpants and being comfy all day? Enter the skirtversion of a pair of sweatpants: the knitskirt! I can't begin to express my love for a good knitskirt - and I have made my share in my sewingcareer. Its soft and comfy, looks allright for work and you can make it in an hour. Only thing you have to worry about is choosing a knit staple enough not to show all your lumps and bumps.. This last point gets more and more important every year.. SO, because i'm in my late thirties I chose a thick knit with a subtle pattern from Stof2000. To add a bit of interest I added pockets zippers. 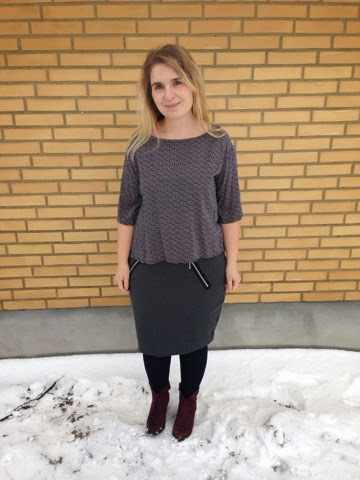 Otherwise its just a selfdrafted knitskirt with an elastic waist. Perfect for the day, your collegue brings cake! 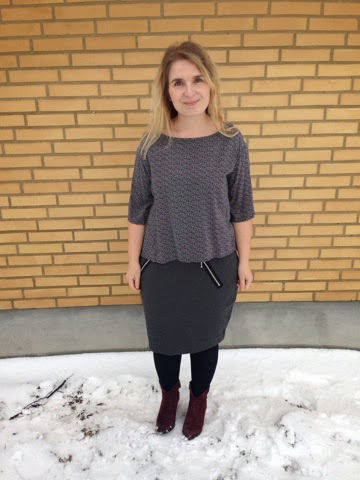 You can't go to work in a skirt alone - not in my job at least - so I made the famous Simplicity 1366. There are so many beautiful versions out there - please check this one by Groovybabyandmama and this one by the talented Mixed Emotions. It's a boxy top with 3/4 length sleeves. Nothing much to say there, except that I love this pattern. I'm not too sure about my fabric choice though. It's a bit too thin and blah. I have actually only worn this top while taking these photos. I'll consider it a wearable muslin and make one in a better fabric. Der er ikke noget som en jersey nederdel! Hvor er den fiks :-) Jeg er vild med lynlåsene. Hvor har du købt mønsteret til blusen? Mønstret til blusen er købt på Simplicitys hjemmeside (husk at vælge eu eller uk, så du undgår told). Der er udsalg på alle mønstre et par gange om året, hvor de sælges til omkring £4. Det er et supergodt mønster, der er nem at variere. Jeg har også set eks. Groovybabyandmama forlænge det til en løs kjole. Coats - the mother-daughter-theme continues..